Since 1997 Wayne Horsburgh has been based in Branson, Missouri (the new home for Country music and live Entertainment in the U.S.A with 7 million visitors anually). In 1998, 1999 and 2002 Wayne represented Australia at the International World-Fest at Silver Dollar City, Branson, along with 500 other International entertainers. He represents Australia once again at World-Fest 2003. 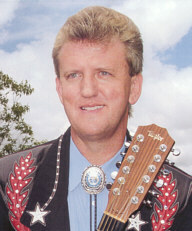 Wayne also appeared at the 'Great American Music Festival' at Silver Dollar City, four years running (1998-2001) with the Horse Creek Band, and during The Music/Craft Festival in September and October 2002, Wayne performed a total of 120 shows, again backed by the Horse Creek Band. ...or E-mail : Wayne !